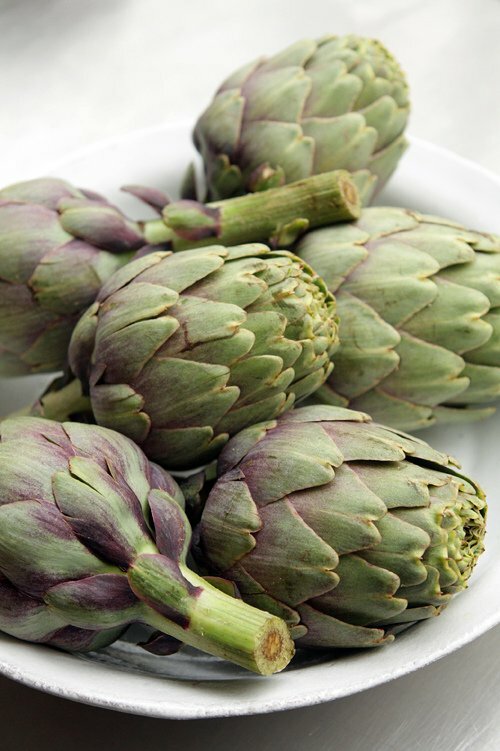 It’s fresh artichoke season and I’m finding them piled up at my local market, practically tumbling off the stands. Last week, I stood there, putting one after the other in my market basket, where I took them home to admire the beauties on my kitchen counter. 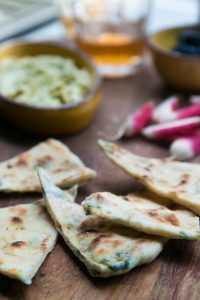 But they’re not just pretty to look at; artichokes are great in salads, risotto, pastas, and even on open-face sandwiches with a spread of fresh cream cheese and herbs. Artichokes are not hard to prepare but they do take a bit of determination, which is why they’re most often eaten whole, and steamed. However there are those times when you want to treat yourself to just the artichoke hearts. And when the prices drop at the markets, and they’re in abundance, I don’t mind spending a little time preparing them. 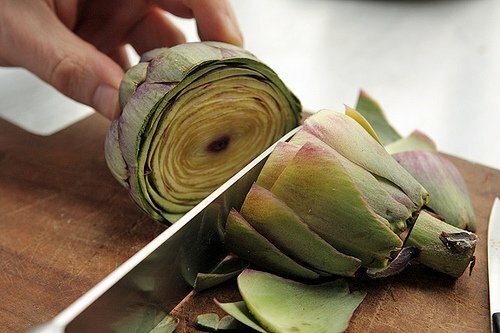 Artichokes will brown almost the moment you slice into them, so you need to make an acidulated water to slip them into when you’re done trimming each artichoke. (They’ll still darken, but not as significantly as if you didn’t use acidulated water. And once cooked, the discoloration should disappear.) Be prepared for lots of leaves to toss out, and if you have a compost bucket, you’ll be making it very happy. Almost as happy as you’ll be when you find yourself with a pan of freshly cooked artichokes, seasoned with olive oil, garlic, and a scattering of fresh herbs. 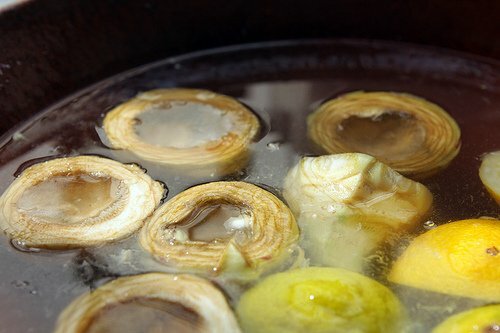 Slide the trimmed artichoke into the lemon water, then repeat with the remaining artichokes. 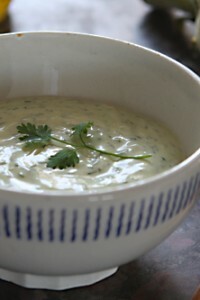 You can use another herb, such as fresh thyme or tarragon – to taste, in place of the parsley. 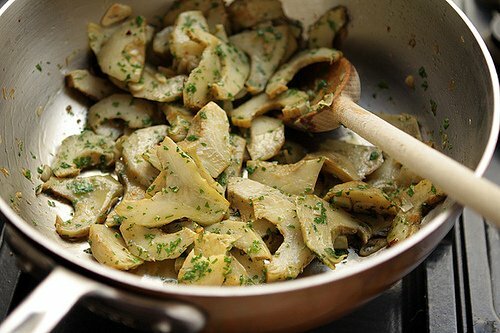 To cook the artichokes, pour the oil and sliced garlic into an unheated sauté pan that has a cover. Heat the olive oil slowly. Cook for about 5 minutes, stirring occasionally, then add the water or wine and the lemon juice, and cover. Reduce the heat to low and cook for about 12 minutes or so, removing the lid and stirring a few times, until the artichokes are tender. They’re done when you can poke a paring knife into one and it meets no resistance. what do your look for in an artichoke? btw, I read your blog regularly and love your recipe, your baked chocolate mousse is classic in our family. Those look amazing. My mom always made us artichokes which we dipped in mayonnaise, and that’s the only way I’ve ever had them (other than pickled artichoke hearts). Must try your recipe. I love artichokes and these look amazing. 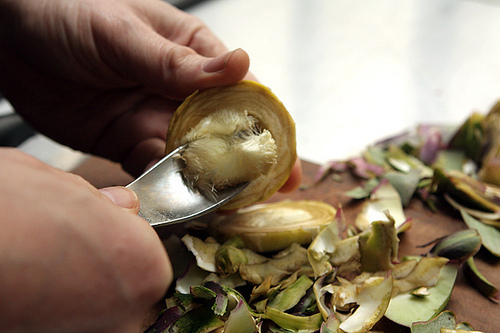 I have only made steamed whole artichokes and was never sure how to sautée just the hearts. Merci beaucoup David for showing such clear steps. I am going to try these over the weekend. I wish you’d posted this last week…. I had some slightly older ones I wanted to rescue the hearts of, but it didn’t work. Normally it works like this: boil them dry by mistake and get yelled at. Eat them anyway and they are lovely. Yell at husband for throwing out the remains of the lemon butter. Another fan of whole artichokes here ! We usually steam them and then dip the end of the leaves into aioli, but I also whole roasted them once wrapped in foil and they were… insanely addictive. Maybe my favorite ever, though, was having Carciofi alla giudia in Rome last year… you should probably just go there in order to figure that one out. This time of the year (although I’m in California right now), I eat asparagus and artichokes like there’s no tomorrow. Hopefully not all will be lost when I return home at the end of May. Thank you for your very clear and thorough instructions and so many photos! 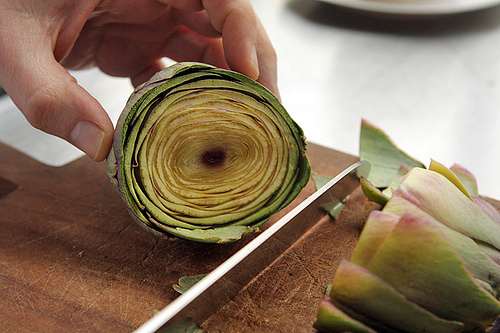 I’ve always wanted to know how to prepare an artichoke besides the steaming method. I’m still in awe of your ability and the time you put in to share with us. Also spied that cool spoon in your photos…. You do not cut the base! You break it with your hand. It make all the hard fiber goes way! Hah! I thought you were “frenching up” freaky with freakeh! Laughs on me! Never having heard of this item. 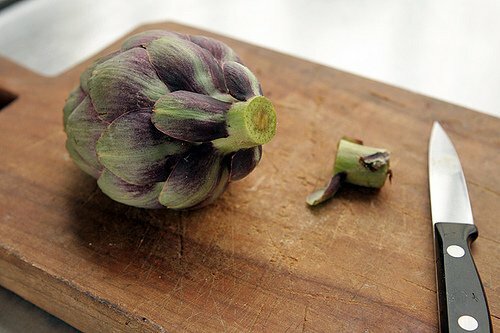 I just bought some very purple, baby artichokes at a local farmers mkt. and the guy said they have no choke! Just slice in half lengthwise brush with oil and grill. Haven’t tried it yet…tonight. Can’t believe there is no choke. Yours also looks like a great recipe. Lots of labor, tho. Thanks for such a detailed account of how to handle fresh artichokes. I see them in the grocery, but they seem intimidating and it’s always easier to grab a can. This is my push to face my fear! here in Scotland they are almost impossible to find, good ones at least. I guess the problem is that they are not really popular outside of southern Europe, so I cannot find them in Pakistani shops for example, which have a good variety of vegetables. I miss them so, such complex flavours for a simple vegetable. And I am from Rome, the world capital of artichoke cuisine! that looks delicious. 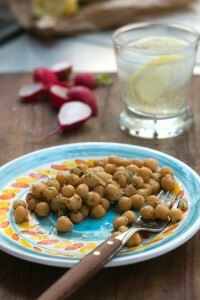 So easy to make and such a lovely accompaniment to any meal. But the outer leaves don’t have to be compost collateral, simply steam them and enjoy as a healthy snack. 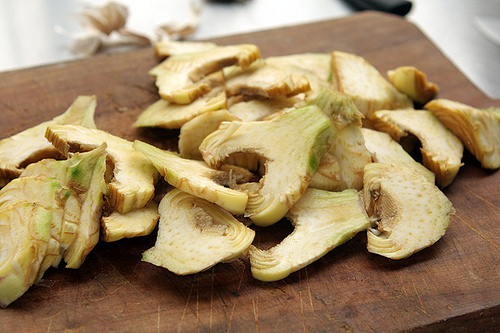 Ah, how wonderful those sliced artichoke hearts look. Like some others of your readers, my mother boiled the whole choke, and had us pull off each leaf, dip in butter, and slither off the meat with our bottom teeth. When we were kids, that was lots of fun … for the first few leaves. And then we got bored, and she got to eat the hearts! Your recipe looks quite delicious. The work looks difficult, but I suspect it goes pretty quickly once you’ve mastered the process by butchering that first choke. I’ll have to give it a try. Thanks again, David, for your always interesting and entertaining entries. How timely, I just got these beauties in my food share box today and was trying to figure out what to do with them. I could live on artichokes, seriously, and pretty much do whenever I see them. And I thought they were a spring thing, but they appeared everywhere this week, and it´s getting cold here, so I don´t get some seasonal vegs anymore. Not that I care. This post is just on time! 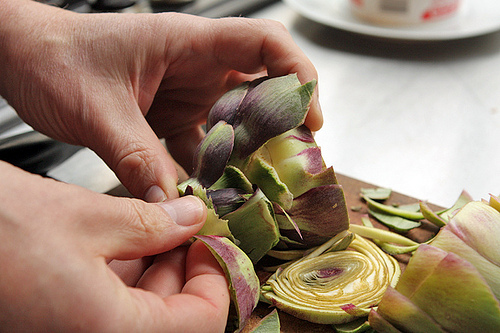 This weekend will be spent amidst artichokes hearts. Couldn´t be happier. Buying two artichokes to share with my family is quite an expensive treat. I don’t think I can justify spending even more just to throw away the leaves, so I think we’ll stick with steamed. The dish looks and sounds delicious. Grew up on boiled artichokes with mayo or lemon butter, which I still absolutely love. But one of my favorite ways, especially if there are small tender artichokes or big tough ones that benefit from David’s trimming method is a Greek artichoke stew. 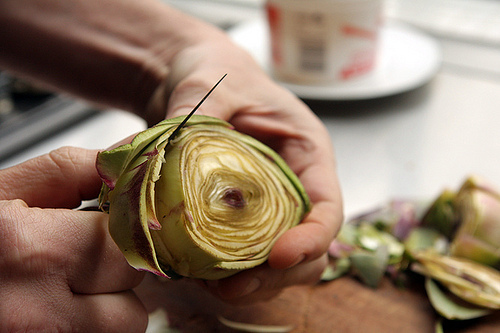 Trim the artichoke and put in lemon water. Then take onions, carrots and waxy potatoes and cut in bit sized pieces. Mix with the artichokes and add water or chicken broth, salt, and quite a bit of lemon, with some olive oil, pepper and some garlic. Bring to a boil, cover, turn down low and either bake or cook over low heat until the vegetables are done. Season to taste with more lemon, salt and pepper, and eat. The vegetables stay bright and fresh looking, and the complex sweet tastes with the earthy metallic artichokes and the lemon… Delicious! Even better left over. And makes just a few artichokes go a long way. 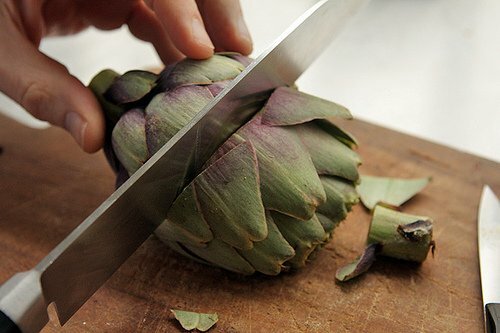 I love seeing how you slice the artichoke. 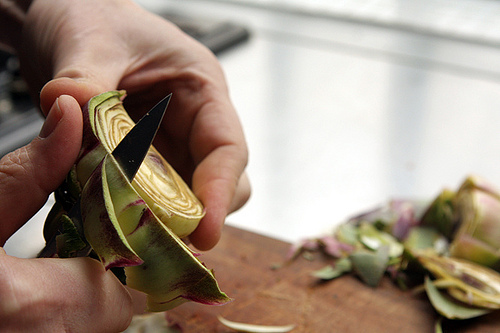 While it isn’t a huge difference, in Italy we always cut the artichoke into wedges before cooking. Never these kind of slices. For no reason at all. Just cultural difference, I think. Oh no! I can’t believe you tossed all that lovely stem! 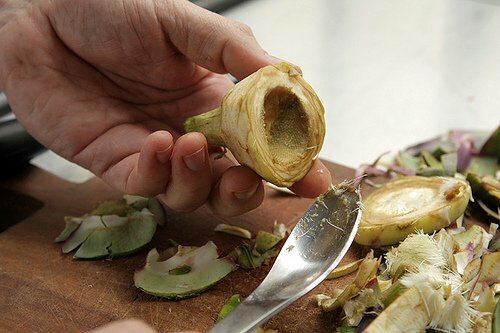 The flavor of the heart extends a couple inches down a freshly picked stem. Peel the tough fibers from the exterior but don’t waste the tender cores. Elizabeth: I do cut them in wedges sometimes as well, although they cook more evenly if cut in slices. 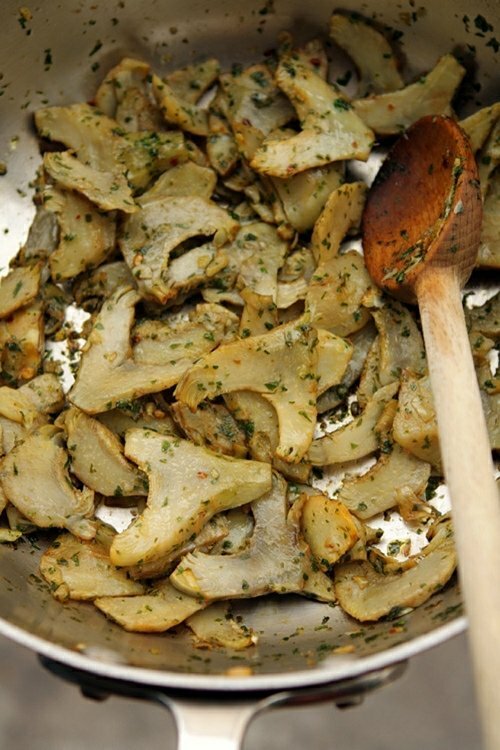 However Italians are the champs with artichokes so I do offer in the instructions that folks can cut them in wedges. Wendelah: When they are pricey, I eat them steamed as well. I second what rainey says about the stems. just trim w/ a veggie peeler, stick in water bring to boil and simmer till tender. 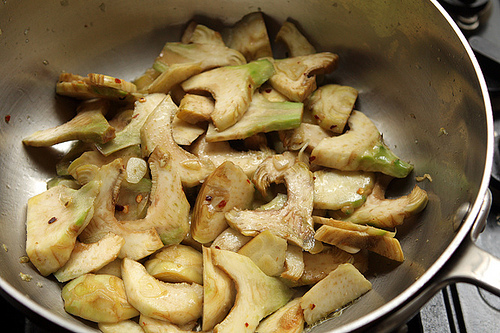 Also I grew up dipping them in a soy sauce and vinegar mixture, I think mayo covers the artichoke taste too much. lovely recipe yours!